Have You Had a Nature Fix Today? 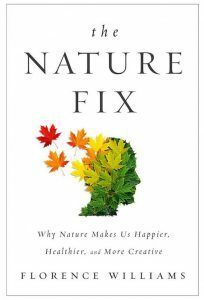 Posted on November 15, 2017 by Hillary T.
At a recent gathering of Mass Audubon supporters, Florence Williams shared what she learned in writing The Nature Fix: Why Nature Makes Us Happier, Healthier, and More Creative. Those in attendance were so inspired by her talk that we reached out to Florence afterward to ask her a few questions. I’ve always felt very connected to the natural world, and for most of my adult life I was fortunate to live in the Rocky Mountains with trails and wildlife all around. But five years ago, we moved to the heart of Washington, D.C. It made me think a lot about the connections I’d lost. I wondered what the latest research had to say about how our surroundings affect our mood, cognition and health. I was also interested in how to reconnect to nature within densely urban environments. Fortunately, there was a lot of fascinating new information out there. What’s your first or most memorable introduction to nature? I spent a lot of time in city parks as a little kid, but my introduction to wilder nature came from camping and canoeing with my dad. I remember being about 7 when he taught me how to jump across boulders in a creek. I remember the adventure of it, as well as the sparkling light and water, the sensory fulfillment. I was hooked as a river and water person. What are a few of the most important health benefits one gets from connecting with nature? It seems like the main factor is stress reduction. Being in pleasant natural environments—even for short periods of time—can lower our blood pressure and reduce stress hormones. Large-scale epidemiological studies show that people living near green space have significantly lower mortality rates, including lower rates for some cancers, cardiovascular diseases and respiratory distress. This was even after adjusting for income. In fact, the lower your socio-economic status, the greater the health benefits. Nature appears to be a social leveler. So that’s pretty cool. And kids who spend more time in nature seem to have better emotional regulation, social skills and self confidence. When researching the book, what surprised you the most? 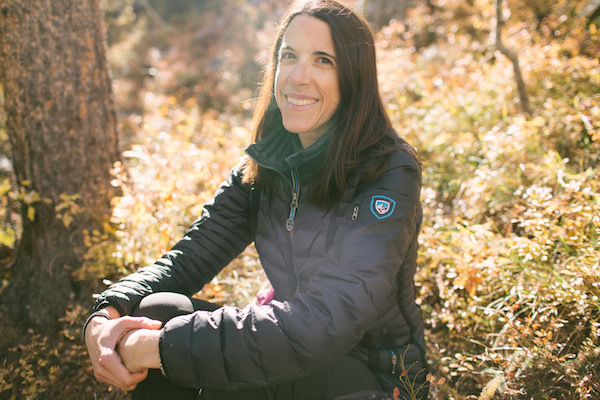 I wasn’t surprised by the health and mood benefits of being outside, but I was surprised by some of the cognitive boosts and some of the social benefits, for example that people tend to behave more generously after experiencing the awe of the outdoors. Nature actually makes us more civilized. How do you, personally, get your nature fix? I had to learn how to find nature in the city and maximize its benefits. Nearly every day, I spend at least 30 minutes in a nearby city park when I walk my dog. We go out in all seasons, and I cultivate being mindful when I’m there. So I take the earbuds out and make an effort to look around at the birds, the buds on the trees, sometimes even feel the bark or smell some pine needles. I enjoy watching the fractal patterns of ripples on the creeks in the parks or the concentric rings the feeding fish make in the canal near my house. I also walk my dog in the neighborhood every evening, where I like to check in on the moon or the sunset. And I think being outside at night helps re-set my circadian rhythms to prepare for a good night’s sleep. It’s not the deep, dark, Colorado night sky, but it’s something. If a reader takes away just one thing from your book, what would you want it to be? Go outside! Go often. Bring friends or not. Breathe. You can purchase The Nature Fix online via the Audubon Shop, where all purchases go toward protecting the nature of Massachusetts. This entry was posted in Shop, Stuff We Love on November 15, 2017 by Hillary T.. I couldn’t agree more with Florence; she is definitely a sister of the spirit. I, too, wrote a book about the effects of being in Nature. One of my portals to that great and glorious world is the Mass Audubon Ipswich River Wildlife Sanctuary, which happens to be just down the street from my home on Boston’s North Shore. I, too, have been a feature speaker at Audubon events. Those of us who love the Earth and the creatures thereof are proving to be a gathering force. And Audubon is a pivotal force in helping to make this happen. I, however, may go one step further than Florence. I think the material Natural world is a reflection of the Spiritual reality embedded in everything. If you want to know why I think this, you may want to get my spiritual memoir THE SACRED SHED ON THE EDGE OF THE RAVINE. Nature heals us and makes us whole, which is why I went walking in Audubon land to find and be among the chickadees following the brutal Boston Marathon bombing. I am grateful to be here with others who love this Sacred universe.